Why does a hovercraft lift blade look one way, but a propeller another? Note the ten rectangular blades. Note the three, traditional airfoil-shaped blades. Why are the two different? Edit: My question is different from the other question cited because it asks about both the number of blades and their shape, as well as other differences I may as of yet be unaware of. Because lift propellors need to provide static pressure to inflate the airbag and hover. This means more fan blades to stop backflow. The thrust propellors need to provide force which is a combination of static pressure and airflow but relies mostly on airflow. This means less fan blades to facilitate large airflow. There are two parts to this: number of blades and squared off tips. A propeller blade is actually just a wing. This is true regardless of weather you are talking about a piston engine airplane, a jet engine, a table fan or the propeller of a cargo ship. A wing is most efficient if the air coming onto the wing is undisturbed. While it is possible to design wings that work efficiently in very turbulent air (for example insect wings, in particular google about research on dragonfly wings) we are not quite there yet in terms of either theory or technology. 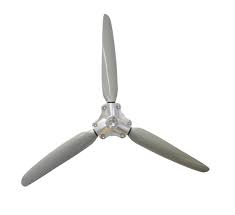 As a consequence, adding more blades to a propeller means each "wing" gets interference from the blade in front of it. More blades decreases efficiency. The most efficient prop of all is the single bladed prop. Some motorised glider designs actually use single bladed props that can be driven with tiny lawnmower engines. However, a single blade leaves a lot of air behind it that can potentially move back up to the low pressure region just created by the prop. Thus, a single bladed prop may be very efficient (uses less fuel to travel the same distance) but generates less thrust. The more blades you add the more thrust the propeller can maintain. If you fly drones you can see this in drone design. Larger drones use two bladed props because their size means that the props generate sufficient thrust and using two bladed props improves battery life. Smaller drones cannot use large props but must generate thrust to hover. Therefore smaller drones are designed with three or four bladed props. For a hovercraft, the hovercraft is not designed to travel upwards forever. They are designed to generate just enough lift to hover. This means the lift prop never gets unloaded (the effect of props gaining efficiency when operating in a moving air stream). So for a hovercraft lift prop generating high thrust while not moving off the ground is paramount. Adding more blades allow you to generate more thrust with the same engine (though it will burn more fuel). It is possible to get the same amount of thrust with a two bladed prop - just make the prop bigger. But a hovercraft is size constrained - you want the prop to be fully contained within the fuselage (this is also why jet engines need more blades). Admittedly this is a secondary and less important factor since some aircraft propellers also have squared off tips - but you did ask. As mentioned above a blade is just a wing. One of the problems with wing design is the loss of lift and increase of drag due to tip vortex. One of the solutions engineers have found is to make the lift distribution from wing root to wing tip to be as close to elliptical as possible. This can be done literally by making the wing elliptical (like the Spitfire) or by altering the wing incidence to be less at the tip and more at the root, basically twisting the wing (often called a washout). If you can't get a perfect elliptical distribution then a rounded tip would still improve lift generation and drag. However, tip vortex cannot form on a hovercraft lift blade because the blade is rotating inside a shroud or duct. The duct physically blocks air from curling around the blade tips. As such you can square off the blade without losing performance. In fact for optimum performance you'd want zero gap between the blade tips and the duct therefore a squared off tip that just fits the duct is better. Not the answer you're looking for? Browse other questions tagged propeller hover or ask your own question.